[George Washington, first President of the United States, and the L'Enfant Plan of Washington, D.C.] Autograph Note to the Commissioners of the District of Columbia, regarding a submission to 'the President of the U. States', by 'Mr. Jacob Welsh'. George Washington (1732-1799), first President of the United States of America; Jacob Welsh (1755-1822) of Harvard; Pierre Charles L'Enfant (1754-1825); L'Enfant Plan, 1791; Washington, D.C.
An unsigned note in the handwriting of the first President of the United States, regarding the L'Enfant Plan for the layout of the future Washington, D.C. 1p, 16mo, on one side of an 11 x 7 cm piece of watermarked laid paper. In good condition, lightly aged and spotted, tipped-in onto a sheet of yellow paper. Nine lines of text, in Washington's autograph, reading: 'Submitted to the | President of the | U. States for considn. | by Mr.
[ A Grand Regency Town House: Two Architectural Plans of 43 Berkeley Square. ] Two finished manuscript floor plans by Joseph Hobbs of the town house of Sir John Harington, 'In its present state' and 'with proposed Alterations'. With three receipts. Both plans by 'Joseph Hobbs | 30 Margaret Street' [ Cavendish Square, London ] Both dated 'June 1815'. Each of the two plans is on a 46 x 60 cm piece of wove paper. Both have the name of the details of the planmaker at bottom right: 'Joseph Hobbs | 30 Margaret Street'. Two finished and professional floor plans of a grand Town House. Both items are aged, worn and creased, with closed tears, but would respond well to archival repair. ONE: 'Sir John Harington Bart | Plan of House Berkley [sic] Square | In its present state | June 1815'. In black and white, with grey shading. Five plans in a line: 'Basement', 'Parlor Floor', 'Drawing Room', 'Two Pair Floor' and 'Attic Floor'. [ Ivor Pritchard, Welsh architect, engraver and book-collector. ] Collection of 54 visual items from his student years, mostly detailed and finished architectural illustrations, many signed, with tracings, photographs, book illustrations. [ Menai Lodge, Chiswick, London. ] Between 1907 and 1910. Pritchard was Architect to the Commission on Ancient Monuments in Wales. His collection of 71 volumes of atlases and early geographies was purchased by the National Library of Wales in 1940. After study at Bangor University, he was articled in 1903 to Joseph Owen of Menai Bridge. Moving to London, he studied at the Architectural Association and Royal Academy schools and trained as assistant to a succession of architects: Walter Frederick Cave (1863-1939), Louis Amber (1862-1946) and Messrs Henry Victor Ashley (1872-1948) and Francis Winton Newman (1878-1953), before qualifying in 1911. [WITH MS MAP] First WW aerial reconnaissance photo. 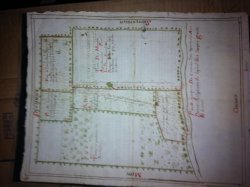 of the area around Passchendaele during the 3rd Battle of Ypres, and intelligence map of the same area, with manuscript plan of the Honnecourt Wood and Lempire-Ronssoy area in pencil on reverse. Passchendaele, Belgium. 'Reproduced & Printed by No 5 Advanced Section AP & SS'. Stamped on the reverse: 'NO. 105 MACHINE GUN COMPANY', with the date '1/9/17' [i.e. 1 September 1917. 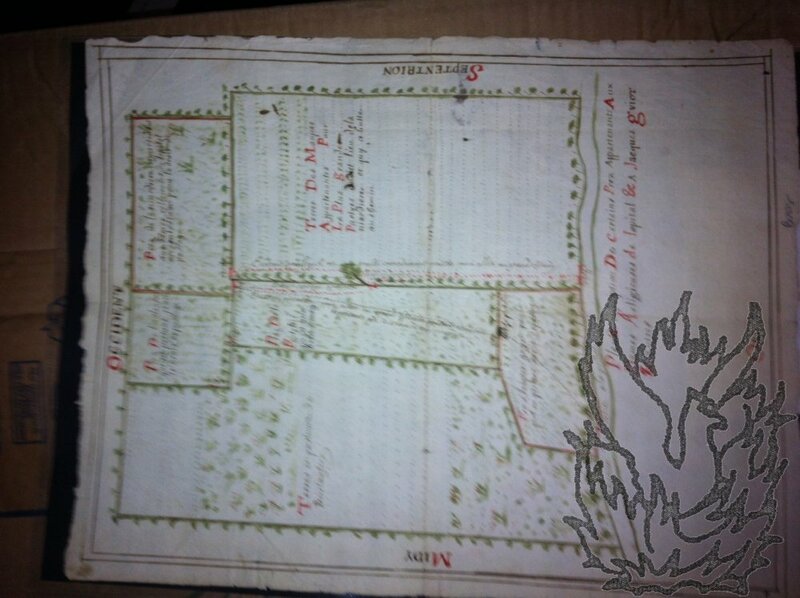 Printed on a piece of card, roughly 50 x 22 cm., with the photographic side shiny and the reverse carrying the manuscript plan matt. In fair condition, folded four times and lightly aged, worn and chipped. The whole of the one side comprises a single photographic print, with 'Reproduced & Printed by No 5 Advanced Section AP & SS' at the foot. The upper part of this print reproduces an aerial photograph, roughly 15 x 22 cm, with six positions indicated: 'Kansas Cross', 'Gravenstafel', 'Passchendaele', 'Otto FM. D. 15a', 'Delva FM. [ Eighteenth-century French map. ] Attractive manuscript map in colours, captioned in French and titled 'Plan & description De Certains Prez Appartenants Aux Dames Religieuses de lopital & A Jacques Gviot & autres'. France [ Chanu, Bayeux? La Châtaigneraie, Vendée? ] Eighteenth century? On piece of 38 x 30 cm watermarked paper. In fair condition, lightly aged. In red, green and sepia. Within a border, and with 'OCCIDENT' at the head, 'ORIANT' at the foot, 'MIDY' to the left and 'SEPTENTRION' to the right. Attractive in design, with capital letters in red and simple tree design around the boders of fields. [ Brewing industry in eighteenth-century Northumberland. ] Draughtsman's drawing, titled 'The Ground Plan of A Brewery Intended at Hexham Bridge End 1777', with front elevations of two maltings. On one side of a 15 x 39 cm piece of Whatman paper. A fragile survival: aged, worn and stained. Drawn to a scale of two inches to 30 feet. Central ground plan ('The Court 73 feet') showing, with size, 'Malting', 'Ale Tonhouse', 'Bear [sic] Tonhouse', 'Brewhouse', 'Milhouse', 'Hop Room' and 'Office', 'Spirit Cellar', 'Tender Trade'. The ground plan is flanked by two elevations. The first is captioned 'The Front of Malting &c to South 71 Feet', and the second, 'The Front of the Malting in the Court Side &c 47 feet'. [Printed Socialist Party of Great Britain pamphlet.] Beveridge Re-Organises Poverty. 20pp., 12mo. In white covers printed in green and black, with the 'Object' and 'Declaration of Principles' of the SPGB on the inside front cover, and advertisements for other SPGB works on the inside back cover. Stapled. Priced at 3d. In fair condition, on aged and worn paper. On front cover: 'This pamphlet shows that the Beveridge Plan will not end the poverty of the working-class. [Cloth-backed lithographic engraving.] A Chart of Anglican Church Architecture: Arranged Chronologically with Examples of the Different Styles. Drawn and Lithographed by F. Bedford, 40 Ely Place, Holborn. Published as the Act directs by R. Sunter, 23 Stonegate, York, and John Weale, 59 High Holborn, London: 17 August 1843. Printed by Standidge & Co. 77 Cornhill, London. An attractive Gothic Revival item, tastefully printed in red and black. Printed on nine 13 x 9 cm panels, laid down on a cloth backing opening out to 39.5 x 28 cm; in original 14 x 10 cm printed card cover, with engraved title on front, within a gothic arch. In fair condition: aged and worn in worn and rubbed covers, with small white circular label on front board. Arranged, appropriately enough, in four columns headed: Name of Style; Reign A.D.; Illustrative Examples; Characteristics. Delicate coloured field plan of 'Part of Hartford Bridge Flats [now near the site of Blackbushe Airport, Hampshire] surveyed and drawn by J. A. Ewart [later General Sir John Alexander Ewart], 35th. Regt. in 12 hours'. [Hartford Bridge Flats, Hampshire.] Undated, but between 1838, when Ewart was gazetted to the 35th Regiment, and 1848, when he exchanged to the 93rd Highlanders. On a piece of thick paper, 36.5 x 38 cm. In fair condition, on aged and spotted and dusty paper, flattened out after being tightly furled, with one short closed tear in margin repaired with archival tape. The field plan is delicately drawn in ink to a 'Scale of four inches to one mile', and coloured in green, blue, grey and red. Collection of nine items (eight printed and one in manuscript) relating to Cambridge University, six of them giving examination results, two of University accounts, and the last a lithographic plan of a visit by a dignitary to the Fitzwilliam Museum. [Cambridge.] Eight of the items dated between 1861 and 1865; the other undated. The collection assembled by William Done Bushell (see Item Nine), later a senior master at Harrow School. All nine items clear and complete. On aged paper, discoloured by the glue used in mounting. The first eight are printed, and the last is in manuscript. ITEM ONE: 'Classical Tripos. | 1861.' 4to, 1 p. Names the examiners, and those of the students (with colleges), under columns for the first, second and third classes. ITEM TWO: Headed 'List of Honors at the Bachelor of Arts' Commencement, January 26, 1861.' 4to, 1 p.